Some tags/sensors are not flashing and cannot be found in search when trying to associate. If a tag or a sensor is not continuously flashing when a good battery is inserted, it is already associated with a tag manager. First thing to try is "undelete" all tags from the app (in iOS app, press "+" then "Undelete", in Web/Android, press "Settings..." then choose "Undelete") so that all hidden tags are showing on the app. Press "+" to expand each tag if you are using Web/Android. Next take out battery and insert it back. On the app screen, one should get updated to "Updated 0 second ago". If this does not help, please refer to this. After you have recovered the tag/sensor this way, unassociate/delete the rest that were not meant to be undeleted. Press "More..." or ">" button in the app then choose "Unassociate" after a while it will time-out and answer "Delete". After battery is changed, tag will not connect; the light on the tag flashes a few times and then stops flashing. When trying to update a tag that has not updated for a long time, it does not work. Each tag has a crystal frequency reference that keeps the same radio frequency as that of the Ethernet Tag Manager (hub). The crystal frequency drift is normally automatically calibrated by the system every time the tag sends the periodic update of temperature/humidity data. When the tag's battery is gone, or has been out of range for a long time, the crystal can drift out of Tag Manager's receiver bandwidth without a chance of being automatically calibrated. Solution: When replacing battery, or trying to update a tag that has been out of range, change Tag Manager receiver mode to "Wide-band (most robust)". (In web, this is the drop down menu in the bottom of screen. In iOS, press gear icon in the lower right corner, and choose "Tag Manager Mode".) This will allow the tag manager to receive the tag's first transmission even with worst case crystal frequency drift. Once a transmission is received, the system will be able to calibrate the frequency drift (either automatically or manually). Unless the signal level is below -100dBm and you are clearly reaching the limit of wireless range, please leave the Tag Manager receiver mode to "Wide-band (most robust)". This is caused by sensor/tag temporarily not able to complete two-way handshake to confirm the tag manager is ready to receive the upload. The sensor/tag will assume that it is still out of range and continue to store data in its local memory, so no data point will be lost. Solution: You can either re-attempt the handshake by clicking "Update Now" button again, or do nothing and wait for the system to automatically re-attempt the handshake eventually (after the configured "search every ..." interval, default is 20 minutes). If the sensor/tag is really back in range, the two-way handshake should succeed, which allows the upload to start. Once the upload starts, you must ensure the sensor/tag is within range of the tag manager until it finishes, because it cannot enter the hibernate/local store mode until the upload of all previously stored data is complete. This happens if the upload is interrupted by another command sent by the tag manager (the tag manager cannot receive while sending commands), or by temporary transmission errors. The sensor/tag will wait for the tag manager to be idle, and automatically re-try and resume the upload. But it may be a while before this happens. (Once the upload starts, the sensor/tag is no longer in local store mode, so it will start the live logging/update at your configured logging interval even during upload or waiting for the upload to resume, so no data will be lost.) You can always manually force the upload to resume by clicking the refresh button (where you set logging interval) and choose "Update Now." Arm/disarm scheduling does not automatically update for Daylight Saving. This is a limitation of the system because the system only records the time-zone offset not your country/region to protect your privacy. Because different country/region may share the same time-zone offset but have different Daylight Saving start/end date/policy, it is impossible for us to automatically adjust for that. However there is a simple solution. Solution: On the day Daylight Saving starts or ends, simply open the Motion Sensor Options screen from either the Web interface or iOS/Android app, do nothing and click "Save". This will update the stored time-zone offset to that set by your Web browser or iOS/Android device (assuming they automatically adjust for Daylight Saving). Motion Sensor Tag in door/gate mode: "threshold angle" in motion sensor option is off from real trigger angle. We realize that the "threshold angle" is not absolute because some parts have mismatched sensor gain among x,y,z axis sensors. Solution: After installation, you should adjust it higher or lower and try opening/closing until you are satisfied with the result. Since a few days ago I don't receive any notification email anymore. We use paid bulk email sending service and dedicated IP address (mta.wirelesstag.net) to send out notification emails. This makes email delivery very reliable for most users, but to ensure good "reputation score" for our email sending IP address (so that our emails don't get rejected because of IP reputation issue), we will automatically mark an email address "blocked" when there is the slightest complaint received that the email we sent is spam or unwanted. We automatically stop sending to any email to addresses marked "blocked". You or somebody used some software to report the email as spam. Your ISP has some sort of spam filtering software that analyze the content of the email and decided that it looks like spam. You clicked the "Block" link on the last line of any of the notification emails from us. Solution: Please find any old notification email and click on the "Unblock" link at the very end of the email. This will move the email address from our "blocked" list which will allow us resume sending emails to that address. If you cannot find an old notification email, go to Password Recovery and have the system send you an email with your password and the unblock link. Even though your email may be on the "block" list it does not affect password recovery emails. Email addresses ending with sbcglobal.net, bellsouth.net, or att.net have a high chance of treating notification emails from Wireless Tag as spam and not delivering them to you without ever giving you a chance of flagging them as not spam. If you are using these email addresses, chances are you are not receiving other important emails as well, so we recommend that you switch to Gmail as soon as possible. Some tags / sensors shipped before July 2016 may require power cycle. If you have sensor tags that were shipped before July 2016, some may become "out of range" even if they are not moved or battery is still good (above 2.65 volt). Solution: Please open the case, take out battery and put it back in (Instructions on removing battery). You may need to set tag manager mode to "most robust" before doing this, see details. For water/moisture sensor that has non-removable battery, shorting the tip into water and then wipe the tip clean/dry can fix this problem. Some sensor may never experience this problem while some will need this power cycle every few weeks. If you have the latter, please request a return label (USA only) and send it back for firmware update. We will install new battery and cover shipping costs. In recent version of the Android app, the notification does not come with sound. We were requested by multiple customers to follow/respect "Do Not Disturb" related settings in various version of Android OS. Specifically, If the "ringer mode" of the Android device is set to silent or vibrate, the spoken message will not play. In Android 5.0 (API level 23) and above, the system wide "Interruption filter" level must be "Priority only" or "All" for any sound to be played. The audio is played through the "notification channel" whose volume is controlled separately from "music channel" in your Android system. Make sure the volume is turned on. Since the tag name audio is downloaded from network, if the device does not have Internet connection, the "custom push sound" will play but the spoken text such as "tag 1 is moved" may not play. Several customers in Europe reported incompatibility issue with AVM Fritz! Box. Belkin Surf F7D2401 is also known to have issues. Some customer also reported incompatibility with a model of Linksys router. This is often caused by these routers not properly having backward compatibility with 10Base-T Ethernet standard. Solution: Use an Ethernet switch or router (that supports at least both 10Base-T and 100Base-T) between these routers and Ethernet Tag Manager. If you insert a period (".") at the end of tag name, spoken event will not include "has moved", "is open", or "is closed". You can buy this product and use together with any USB modem you can buy from your carrier for free, such as this one. Then you can connect Ethernet Tag Manager to it. If there is no power outlet, you can use a portable USB charger to power both the TPLINK router and the Tag Manager for up to 10 hours. For example, you can install Wireless Tag Pro at multiple locations without Internet access. Then once a week, you go nearby the installation location with your Ethernet Tag Manager and use your Web browser to update the tags one by one to have them upload captured data. Logging temperature at specified interval. From the iOS app, click the "refresh" button at the button of the tag detail screen to choose different "Update every.." interval for each tag, or at the button of the tag list screen to set the interval same for all tags. Temperature is logged at this interval. From the Web app, click "Options" under a tag, then "Auto Update" to set the interval individually, or choose from the Auto-Update drop down at the top of the screen. Increase battery life without reducing logging interval. From the Web Interface, click the "Settings..." (bottom of screen) then "Wireless". Choose "within 4 sec" for "Response Time" on the right side for "New Setting". This will reduce the frequency each sensor/tag checks for user initiated command, reducing a major source of battery drain. While the case for PIR and Reed KumoSensors are easier to open because they are larger, it can be challenging to open the case of one of the Wireless Sensor Tags without the right tool. If you find yourself opening the case of these very often, we recommend that you get the best tool for the job here at Lowes.com. This works much better than any flat head screw driver. DHCP server is disabled on the network (devices require static IP to connect). If the "!" light is flashing rapidly, a few times per second, it means your firewall is blocking outgoing TCP port 6667 connection. Some corporate network allows only outgoing TCP port HTTP(80) and HTTPS(443) so Tag manager cannot be used inside such network. You have to open out-going port for TCP 80 and 6667 (IRC) connection. Some firewall will initially allow IRC connection but cuts it after a while. In such case, you may get "Your Tag Manager is not connected to the Internet" even if the green "cloud" icon is lit. 1. Disable your laptop's WiFi, and connect to the same Ethernet port you are using to connect your Tag Manager. 2. For Windows, click start button, and type "cmd" to open command prompt, for Mac, type "terminal" in spotlight to open it. 3. Type "telnet mytaglist.com 6667" then press enter in the window. 4. If you get any kind of error message, you need to configure your firewall. 5. type "USER a a a a" press enter and then "NICK bbbb" press enter. If you don't get any error message that causes the "telnet" command to exit eventually, your firewall is properly configured. The battery voltage drops very quickly when tag is placed in fridge/freezer. CR2032 or CR2450 batteries installed in these tags will exhibit lower voltage at lower temperature, and higher voltage at higher temperature. Please see below graph, which shows the battery voltage in y-axis and the amount of "juice" (unit: mAh) consumed in x-axis. The battery voltage will drop very quickly initially, but will stay at around 2.8V at room temperature for a long time. At the same amount of remaining capacity, battery voltage may be 2.5V at -20°C when it is 2.8V at 23°C. The app calculates the "battery remaining percentage" without taking into account the temperature, it may show an artificially low remaining percentage when the tag is placed inside fridge or freezer, despite the fact that the tag will keep functioning for a long time at that state. The tag hardware is designed to operate properly at any battery voltage between 2.2V and 3.6V . What does "threshold window" in temperature/humidity monitoring options mean? When temperature is hovering around the "too cold" or "too hot" threshold you configured, to prevent back-and-forth notifications of "too hot/cold" and "back to normal" from being sent, the threshold window adds a known "hysteresis" to the boundary. The threshold window does not affect when you will get "too hot" or "too cold" event. It only affects when you will get "back to normal" events (and subsequent too hot or too cold event, because the tag only notifies you once) For example, If you have 2.1°C threshold window and 14.0°C "too cold" threshold, it will notify "too cold" when it is 14.0°C and then "back to normal" when it is 16.1°C. The 3D compass/angle based motion sensor tag suddenly started to produce false moved/opened alarms. Why? 3D compass based motion sensor is very sensitive to eletro-magnetic field change, so avoid placing these tags close to electrical appliances such as TV, washer/dryer, monitor, laptops or microwave ovens. Use Accelerometer-Base Wireless Tag for such environment. As battery becomes weaker (below 50% remaining), false alarm will increase. Reduce sensitivity (also increase threshold angle for door mode) in motion sensor options to compensate, or change battery. Accelerometer-Base Wireless Tag on the other hand does not produce more false alarms when battery is low. I just associated multiple 13-bit sensor tags and/or PIR or Reed KumoSensors. They are showing widely different temperatures differing more than 10°F. Sensors with 13-bit temperature/humidity sensors are factory calibrated to +/-0.8°F (0.4°C) error. However, they need about 30~60 minutes after power on (battery insulting tab removed) to reach (settle to) this accuracy. If you enable periodic temperature reporting, you will see in the temperature graph the temperature all eventually settle to correct value. Sensor tags are showing different temperatures even though they are installed at the same location. Sensors with 13-bit temperature/humidity sensors are factory calibrated to +/-0.8°F (0.4°C) error, while more inexpensive 8-bit temperature sensors can have up to +/-10°F (5°C) error before any calibration is applied from the app. Because only the latest sampled temperature is displayed next to each tag, if you are using a long auto-update interval the sampling instant of two sensors may be very different; and if the temperature is varying faster than the interval, naturally the displayed temperature will be different. To compare the temperature you have to click the "Update" or "Ping Tag" button under each individual tag ("Ping All Tags" button only works to check wireless connectivity of each tags, it does not read the current temperature/humidity) one after another. If you have any doubt, please set the auto-update interval very short e.g. "every 30 seconds", and plot the temperature/humidity from multiple tags at the same location, using the blue stats button under the tag list, so that you get a visual understanding of sampled temperature data from each tag with sampling time information. There is still a consistent offset between temperature readings of 2 tags that should read exactly same temperature. How to Calibrate? To apply calibration, wait for the temperature to settle (stop changing in reading after pressing Update button) then press "Temperature" check "Advanced" then enter the correct temperature then click "Calibrate". What does it mean when the PIR (infra-red) sensor shows "Timed out" state with black background? This just means no motion is detected and the sensor is ready to report any motion. It is equivalent to the "Armed" state in other systems. We use a different terminology for PIR sensors and motion sensor with "notify at motion stop" option enabled. This is confusing at first, but it just means the sensor transitioned to such state because of a timer you programmed (in motion sensor options screen) timed out. Think of a motion activated light. When no motion is detected, a timer starts, and it turns off light after the timer times out. The timer is reset to 0 when motion is detected again. If there was no such timer, as soon as motion is not detected it turns off light, then the light will be going on and off/flickering all the time. Not showing "timed out" state as "armed" state allows you tell if the sensor is PIR or regular tag, or if a tag is configured with the notify at motion stop option. How do I delete temperature or other log data? From the web interface (https://www.mytaglist.com/eth) click the tag whose log data you want to delete, then click "More.." then click "Temperature Charts", then scroll to the bottom of the page and click the yellow delete data button (this deletes all displayed data for the tag, and cannot be undone). The button is not available in the multi-tag charts screen (Stats button on the top page) because we can only delete data for one tag at a time. To delete motion sensor related event data logs, click "More.." then click "Event Graph", then scroll to the bottom of the page and click the yellow "Delete Motion Log" button. How do I change the time-zone of the displayed temperature/humidity or other types of graph? The graph uses the tag manager's time-zone which is updated automatically every-time a user uses a Web browser or iOS/Android app to log in to the account. The time-zone updated is the time-zone configured on your client device (PC/Mac or iOS/Android device). After you relocate the tag manager to a different time-zone, simply adjust your client device, re-open the app/Web interface. How do I change the time-zone of arm/disarm scheduling and schedule object used in a KumoApp? These settings are not automatically updated every-time you login. To update them to the setting used by your PC/Mac or iOS/Android device, you need to open the Motion Sensor Setting (for arm/disarm scheduling) or click the KumoApp "Configure..." button, then click the "Save" button. Make sure the tag manager is connected to Internet, with green cloud icon lit, and WiFi icon gradually ramping up/down, and then from the app, change "tag manager mode" to "wideband (most robust)". Note: This option is only visible in the iOS app from the gear icon. In Web/Android interface, it is set to "wideband" by default and the option is hidden. If you have never touched this option you can skip this step. At the instant battery is inserted, look at the orange up arrow on the tag manager. If it flashes, the tag is still connected to the tag manager. If you have tried to "un-associate" the tag using the app, you may need to click "Settings" then "Undelete" (web interface) or press "+" then "Undelete a Tag" (iOS) to bring back in order to see the update. The tag may also flash or beep once depending on the settings the user configured previously. If the up arrow does not happen, and the tag starts to continuously flash at about 1 second interval, it can be associated like a new tag. If you reached this step, the tag hardware is damaged either due to water, dew/condensation, or dropping, or flash memory is corrupt due to drained battery left inside tag for many months (a possibility except for Outdoor Probes) and needs to be sent back for repair or replacement. How do I reset a tag's flash memory? We recommend that you unassociate using the Tag Manager. If that is not possible you can open the case (instructions) and short pin 1 & 3 (or pin 3 & 5 for Water/moisture sensor, see picture) using a wire (e.g. paper clips, metal tweezers). A good battery must be installed while you do this. After the wire is removed, the tag should beep once and start flashing, indicating that it has been reset to unassociated state. 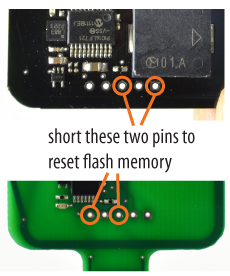 For Water/moisture sensor you will need to dip the tip into water or short the tip to wake it from shelf mode, and for the Reed Kumo-Sensor you will need to swipe the magnet on the left side per instruction to make it start to flash, just like when you first got it. These steps won't work if the "lock flash memory" option was turned on when the tag was associated. By default, this option is off. How do I investigate if I do not receive notification (sometimes or never)? If you do not receive push notification or email, please follow these steps to get a better idea what may be wrong before contacting us. There are 3 possible causes: a) mytaglist.com cannot send push/email to your phone. b) the tag cannot send event to the tag manager, or c) sensor IC on the tag has malfunctioned. To check if (a) is true, after logging in at mytaglist.com/eth, go to http://mytaglist.com/debugconsole.aspx and click the "Notify Offline" This will send a fake tag manager offline push event. Check if you your phone can receive the push message. To check if email is working, from http://www.mytaglist.com/recoverpassword.aspx send an email to yourself. If these are working, then (a) can be eliminated. To check if (b) is true, check if beep or light on/off command works. If not, take battery out from the tag and re-insert. If this works intermittently, it is possible there is radio interference with another un-certified or poorly designed 433MHz device operating in your vicinity. In the past, our customer has solved these issues by migrating to a different frequency. You can do this from web interface, click settings->wireless, and pick a different frequency than the default 439MHz. First try 431MHz. Leave the other settings alone as changing them is not needed to solve your issue. Then click migrate. Depending on how many tags you have, you will need to wait 10~25 seconds for this. If there is some tags that did not respond, they will show a yellow "migrate" button. Click this button to finish them off. If they do not respond, click more->use new wireless settings, and check if they respond. If you follow this procedure 99% of time you will get every tag to the new frequency (this depends on how bad the interference is in the old frequency channel). If you cannot migrate some tags, follow this picture to manually reset the tags to unassociated state. Then you can search them and associate them again. The newly associated tag will use the newly configured frequency. If the tag responds to commands like beep or light on, (b) can be eliminated. To check if (c) is true, disarm the tag, and arm it again. When tag is moved, check if the LED light on the tag will flash. If not flashing, sensor IC on the tag is defective, please contact us. Check that at the same instant the LED on tag flashes, the orange up arrow light on the tag manager flashes. If not, radio transmission from tag to tag manager is not working. Usually the tag will re-try a few times (the LED on the tag will keep flash until the up arrow lights up). If the retry count is too many, consider following procedure in the previous paragraph to migrate to a different frequency. One of my tag is not working or not showing up on the list. The LED is not blinking. If you have tried to unassociate the tag, then if the tag manager failed to update the tag's flash memory the tag will not start to flash. This means the tag is still associated with the tag manager. If you don't have the tag on the list, from the Web interface (mytaglist.com/eth) click "Settings..." button at the bottom of screen, choose "Undelete" and choose the tag that you may have removed from list. Click "Beep" button and see if it works. If not, click on the tag to expand, and click "More..." choose "Use new/old wireless settings" to switch between the settings before/after your change, and see which one will make "Beep" button work. If neither one does, open the case, and short pin 1 & pin 3 like shown in this picture. This will reset the tag flash memory to factory shipped state (unassociated state) which will allow you to associate it again. After I tried to associate a tag with another tag left in unassociated state (flashing) both got associated to the same entry on the tag list. How to undo? Unassociate the problem/double entry, and one tag should start flashing if unassociation succeeds. Search & associate the tag you just unassociated. From web interface, choose "Settings.." at the bottom of the page then "Undelete". Choose the tag you unassociated in step 1. The tag entry will re-appear in tag list, from there unassociate it again. The other tag should start flashing. Search & associate the other tag. What is the difference between "Out-of-range" indication and signal strength indication? "Out-of-range" indication only shows up when "Auto-Update" is enabled. "Auto-Update" configures each tag to periodically transmit a status update (i.e. temperature and battery voltage) back to Tag Manager and mytaglist.com Web Service. "Out-of-range" indicates that the periodic status update is not received at an scheduled time. On the other hand, signal strength indicator (bars) indicates the signal strength of any radio transmission Tag Manager received from a Tag last time (to find out when was that "last time", look at the "Updated ... ago" display.) When the user issues an command such as "beep" to a Tag and it fails to respond, the signal bar will drop to "No Signal". This is why sometimes you see "out-of-range" even when signal bars shows good signal level, and why some other times, signal strength shows "No signal" but "out-of-range" indicator does not appear. Why is a yellow "Calibrate" button displayed? You can configure different "receiver bandwidth" of your Tag Manager. If you choose a narrower bandwidth, more noise will be filtered, resulting in longer wireless range, if the tag's transmission frequency is accurate enough to be within the receiver bandwidth. When tag manager senses the error in a tag's transmission frequency to be larger than the configured receiver bandwidth, it displays "Calibrate" button on the Web interface. When this button is clicked, tag manager updates the tag's flash memory to correct the frequency drift. It then pings the tag, and if there is no more frequency drift, the "Calibrate Radio" button goes away. When you choose a narrower bandwidth from the drop-down, "Calibrate Radio" button will be displayed more often. Tag's transmission frequency error is most often caused by temperature change. After you place a tag in an environment with very different temperature than when you last received transmission from the tag, "Calibrate Radio" button will often be displayed. To relocate the tag from one environment to another with very different temperature, you need to first set tag manager's receiver bandwidth to "widest (most robust)", then wait till the tag's temperature stabilized, and make sure you receive a few transmissions (sent at the auto-update interval) from the tag. Then change the bandwidth to narrower settings to improve the radio range/performance. At this time the Calibrate button will likely appear, so click it to calibrate the radio. Yes we ship worldwide. The shipping cost and available shipping methods will be automatically calculated at Step 2 of check out after you entered your shipping address. If you are buying from outside of USA, you must take all responsibilities of importing it into your country. Our products are FCC part 15(c) and CE certified. Can one account control multiple Tag Manager to cover wider area? Yes. This feature has been implement in iOS app 1.6 or above, and on the latest mytaglist.com/eth/ Web interface and Android app. To add a Tag manager to an existing account, from the Web/Android app, click "Settings", then "Account", then "Add Tag Manager". Although currently only Web/Android app allows managing the list of Tag Managers, both iOS and Web interface allow quickly switching between tag managers. Will multiple Tag Managers interfere with each other, and with other devices (e.g. garage openers) using the same 433MHz band? Each tag manager has 24 bit unique code + 8bit code identifying each tag, to distinguish communication it transmits/receives from other communications in the same frequency. Also, you can wirelessly re-program the flash memory of each tag to change the frequency it uses to talk to its tag manager, in the range of 431MHz to 439MHz in 80kHz step, so there are hundreds of channel choices. If you choose a different channel in each tag manager, there is even less chance of interference. Will we ever charge for usage of mytaglist.com and associated Web service? We will never charge anything for the online service. Our web service is currently hosted by Rackspace, it is a dedicated server in Chicago IL to ensure it has good response to our customer base (mostly in USA and West Europe). It costs very little (in the order of cents/month/user) to run the web service, and >99% of the cost of this product is in the hardware. Therefore it does not make sense to charge any monthly subscription fee. I want to become reseller/What is your pricing for large quantities? If you are interested in re-selling this product, you may want to first consider our affiliate program where we offer a good referral fee, so you don't have to duplicate the effort of order picking & packing & shipping. You can focus on reaching your customers. We do currently work with several distributors such as OnSolution in Australia who specializes in temperature sensing/logging products. If you intend to use large quantity internally, the price is open because both our supplier and we, keep tight control on stock level, i.e. some components to make this product is not always in stock and may have several months of lead time, and we do not always keep a lot of stock for all products. You would need to make us offers, i.e. at this price you will buy this much if delivered within this amount of lead time, at another price you will buy this much, and so on. If we agree on one of your offers, you will pay us in advance and we will deliver your order within promised lead time. Please email sales@wirelesstag.net for this. This product is not water-proof, and is for indoor use only. With prolonged exposure to condensation/dew the tag can also get damaged. If you plan to use it in high humidity area, you are advised to put the tag in a sealed pouch such as "Ziplock" with a bag of Silica Gel. Of course you will not be able to record/monitor humidity this way. (UPDATE: now you can order rain-proofed tags that can also record humidity) If your tag has humidity sensor, we recommend that you enable monitoring so that you get notified when humidity exceeds 95%, when condensation will form, and immediately dry the tag. The water/moisture sensor tag has coating to protect against water splashes, but the portion with electronic components should not be submerged into water. How do I trigger/integrate with Phillips Hue Lamp from KumoApp? Follow the steps below "So, let's get started". Once you generated an username and password you can install KumoApp "Turn on Phillips Hue Lamp when door is open and off when closed". The Hue bridge IP will be automatically filled out because of the special placeholder with suffix "_H": <%Hue bridge IP address_H%>. You can add your custom logic by modifying the code of this KumoApp, change the name of the KumoApp and press "Create App". How do I calibrate Soil Moisture Level? Unlike temperature sensor calibration, which is a single point calibration where we apply a fixed offset to sensor reading, soil-moisture level (0-100%) calibration can set both offset and gain (scale) of the sensor reading. This is also known as "two point calibration". First, place the water sensor in an environment that is very dry (e.g. out of the soil or water, and wipe surface clean), click "Update Now" to get the moisture reading in that state. Open the moisture option screen and drag the slider to "0%" and click "Calibrate". Next, place the sensor in a state you want to define as 100% moisture. Click "Update Now" to get the reading in that state, and open the moisture option screen and drag the slider to "100%" and click "Calibrate". We recommend that you search resolved support tickets and on the Google Forum for similar issues other users may have experienced in the past and responses from our support team.